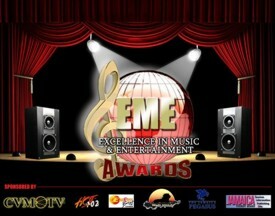 The 7th Annual "EME Awards Nominations Show" is slated to take place on Saturday, March 12, 2011 at The East Lawn of the historical Devon House in Kingston, Jamaica. Sponsors include Energy Beat Ltd, CVM TV, Jamaica Tourist Board (JTB), Zojak Worldwide, HOT 102 FM, Starlight Productions, IMAGESnewsletter.com, Grafton Music and Entertainment Konnections. Start voting here.